1,400-year-old Ginkgo tree on the grounds of the Guanyin Temple in Luohandong village in the city of Xi'an, Shaanxi Province, China. This tree is thought to be planted for Emperor Li Shimin, founding father of the Tang Dynasty, ruling from 629 to 649. 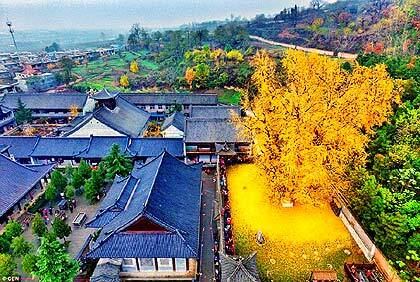 It has been visited by thousands of tourist to watch its golden leaves. More photos on People's Daily online and DailyMail and on my Twitter. Beautiful video of this tree: click here. Jardin des Plantes in Paris has several Ginkgo trees (Arbre aux quarante écus) planted in the 19th century. On my website I mention these trees with photos/video. Videos by Serge Lange on YouTube. The Internet Archive Wayback Machine has archived my website since I started it in 1999. Now a recent project (2011) in the Netherlands by The National Library of the Netherlands Web Archive - Webarchief van Nederland Koninklijke Bibliotheek (KB) - selected and archives my website The Ginkgo Pages and this blog for present and future generations. containing scientific and cultural content. Another area of interest is innovative websites and popularity. Website archiving is adopted by UNESCO: Charter on the Preservation of the Digital Heritage (2003). Comments on this blog will not be archived. Location: Ōshika near Fukutoku Temple, Nagano Prefecture, Japan. More info and videos on my website. Video on YouTube by kaeru umigaeru. * New topic: My website and blog are archived in the National Library of the Netherlands Web Archive (Webarchief van Nederland Koninklijke Bibliotheek) for present and future generations. * New photo on Photospecial page: potted Ginkgo in fall colours.